Yes, there is life in Boca Raton after 10 pm and not just fast food outlets, pizzerias or after hours bars. I’ve lost count of the number of times I have been asked to recommend a full service restaurant that keeps the kitchen humming past midnight. You can imagine my delight when I arrived at Michael Gibson’s Boca Resto Lounge to discover that the kitchen offers a menu until 2 am. (Yes, you read it correctly: 2 am). Of course, you don’t have to arrive in the early morning, although evenings can be very exciting. Music, that great humanizing invention, is in the air several times during the week. Not only can you eat and drink the best the house has to offer until the wee hours, but you can also enjoy countless spins around the dance floor. The spacious outdoor patio is ideal if you wish to dine al fresco. A full service bar dominates one portion of the space while clusters of tables provide a casual setting for groups of all sizes. Service is always punctual and professional. The interior of the complex has an imposing dining area with a high brick arch, an elaborate wine case and elegant glass panels. An intimate space in the rear is ideal for private parties. With its recessed and overhead lighting, the room is an absolute success. A cozy, inviting inside bar provides an outstanding collection of drinks, domestic and imported wines as well world renowned beers. Happy Hour (4-6:30 pm) discounts food and beverages up to fifty percent. The menu is elegantly constructed and reasonably priced. The sumptuous Sesame Seared Tuna ($15) is beautifully plated with cuts of bright red seafood artfully arranged over delectable Asian slaw. Argentine Chorizo ($9), grilled with a touch of crispness, radiates with savory fragrances that can be modulated with touches of homemade chimichurri sauce. For a winning trio of openers, be sure to call for an order of Argentine Empanadas ($9). 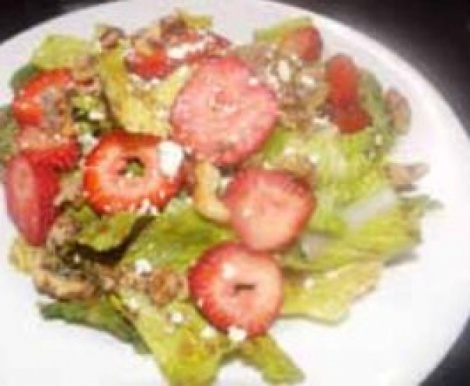 Strawberries and Greens ($12) with Romaine lettuce, candied walnuts, fresh strawberries, blue cheese and balsamic drizzles made for a scrumptious quartet. From the mains, Resto Grilled Salmon ($21) was ever so appealing with its perfectly encrusted filet accompanied by a medley of fresh vegetables.